A handheld sewing machine is a pint-sized powerhouse that delivers a host of benefits. You can make repairs, as well as stitch lightweight materials and fashion designs on the fly. Most designs will easily fit into your handbag and can work without electricity. 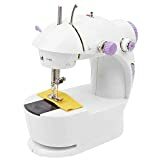 However, shopping for the right handheld sewing machine can be an unnerving experience, especially with the wide variety of models and features. This buying guide will decode the essentials for selecting the best handheld sewing machine. Mini handheld machines: These models are and fit easily into your handbag. They are more suitable for on-the-spot corrections. 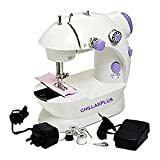 Portable desktop sewing machine: These are comparatively larger machines, which can alternate between handheld use and desktop use. They are obviously more powerful and versatile than the simple handheld machines. Ease of use: Most users prefer a machine that is easy to operate and handle. Some models come with complicated features that are difficult to understand and implement. User manual: After going through thousands of handheld sewing machine reviews, we came to the conclusion that a detailed and clear user manual is a must with a handheld sewing machine. Many users complained of instructions that were ambiguous or details that were missing from the instruction manual. Reliability: Most users insist on selecting brands that are well-known. You can never go wrong with an established brand, especially if you will require repairs, replacement parts, or service assistance. Check portability: If you are opting for a handheld sewing machine instead of, or in addition to, the regular desktop model, portability is obviously on the top of your list. You should consider the dimensions of the machine and its weight to determine how easy it is to carry from place to place. If you travel frequently and require a machine to make quick repairs on the go, look for a model that will fit into your luggage. On the other hand, if you work in the fashion industry and require a machine during presentations, you would be better off with models that fit in your purse. Check product durability: Portability is, of course, important, but don’t forget about the durability and reliability of the product. You should select trusted brands that manufacture good quality durable products, which can withstand rough use. You should always read customer reviews to get a fair idea of the strength and longevity of the machine. Metal bodies should be preferred over plastic exteriors. Versatility: You cannot expect a handheld sewing machine to perform all the functions that are a breeze for your desktop model. 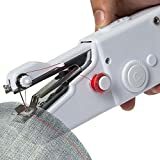 However, you should expect it to perform adequately on several counts, including hemming, mending holes or frays, and stitching simple designs. It should be able to handle a variety of materials reliably: most handheld machines work well on thin fabrics, wool, polyester, cotton, silk, leather, and denim. The size of the hole on the needles: The eyes of the needles should be of a reasonable size for convenient threading. Many models have very small holes--this can be a real strain on your eyes. Additional adapter: Most of these models work on AA batteries. Nevertheless, having an adapter means that you can recharge at your convenience. Some models include the adapter with the product, while you may have to buy the adapter separately for other models. Add-ons: Quality brands usually provide you with extra needles and bobbins. Additional features: Some brands provide additional features, such as two stitching speeds and the option to switch between desktop or handheld operation. Singer is one of the oldest and the most trusted names for sewing machines of all kinds. They have maintained their reputation for decades by their unwavering commitment to quality. Imax is a well-known brand for handheld sewing machines. Their products are durable, well-designed, and sport the best-in-their-class features. Sunbeam has been guaranteeing customer satisfaction for several decades. The brand manufactures some of the most popular handheld sewing machines, which provide the best value for your money. They are presently owned by the Newell Brands Company.